My Charm giveaway | Cosa Mi Metto??? Hi girls! Hands up who loves these heart charms! I know, they're adorable! 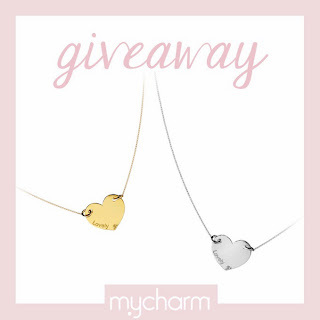 -Share on your wall your favorite picture of My Charm collection from My Charm Facebook page and write: "enter the giveaway to win one of the Mini My Charm necklace, follow the rules on http://www.cosamimetto.net/2013/11/my-charm-giveaway.html"
-Don't forget to leave a comment with your email to be contacted!!! Ciao ragazze! Alzi la mano chi ama queste collane a forma di cuore! Lo so, sono adorabili! -Condividi la tua foto preferita di una collezione My Charm dalla pagina Facebook di My Charm scrivendo: "partecipa al giveaway per vincere uno dei ciondoli Mini My Charm, segui le istruzioni su http://www.cosamimetto.net/2013/11/my-charm-giveaway.html"
-Non dimenticare di lasciare un commento con la tua email per essere contattata!!! partecipo molto volentieri, sono stupendi!! Che cariniiii!!! Senti bella mammina ma quando ci sentiamo??? ma che amore queste collane! favolose :) incrocio le dita!!! Ma è bellissimo il cuoricino dorato!!! I don't do Facebook, but these are lovely, all the same. BTW, those Dav boots you wore in Turkey last year? I bought a pair and they are AMAZING! So far, they're holding up to a Chicago winter. Great traction! In bocca al lupo a tutte! bellissimo giveaway!! SPERIAMO DI ESSERE ANCORA IN TEMPOOOOOO!